No Need To Pretend Anymore - I Can Now Say I Like Who I Am! Slimmer Niki, who transformed her life by losing over 4 stone, is using her success to shape a whole new career helping other people change their lives and achieve their weight loss dreams too. Before her journey began, Niki's weight was something that she tried not to acknowledge as it crept up and up, "I was stuck in a rut and food was my comfort and my enemy all rolled into one. "I came across as confident, but inside, I was full of doubt. It was all pretence. The jolly persona, the painted on smile - people would never have guessed that I hated what I saw when I looked in the mirror, the comments like 'You've got such a pretty face' translated to me as 'Pretty - but WOW you're fat!' "
Niki also suffered joint problems and Plantar Fasciitis, which can be weight related, but Niki admits that at the time she denied that to herself, saying "I was just unlucky." "My cousin had moved back to Chesterfield and we were talking one day about being fed up with our weight, she received a Slimming World flyer through the post and we mulled it over, then a friend told me about Slimming World, she had joined and had lost so much weight but was able to eat all the things she loved, we decided to give it a whirl." Just after the New Year, Niki nervously stepped into her local Chesterfield group. "I was expecting a room full of eyes to turn and stare at me. I couldn't have been more wrong, everyone was so warm and friendly and I quickly realised that we were all in the same boat; no-one was there to judge me!" 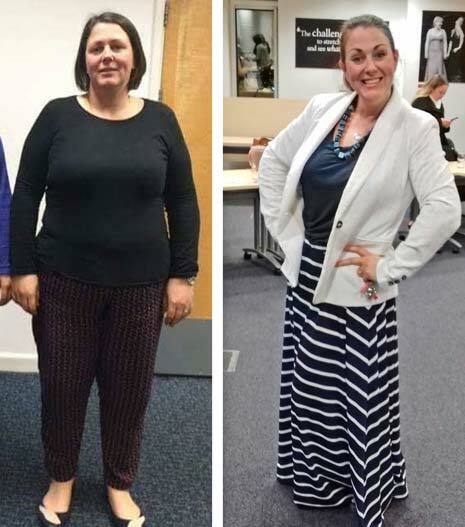 Niki learned all about Slimming World's food optimising plan from her consultant Diana and, after her first week, she stepped on the scales and was astounded, "I'd lost 8 lbs! I'd filled up on cooked breakfasts, curry, lasagne, chips, all my favourites; I could even eat chocolate every day! "My husband couldn't believe the results either and he loved the fact that we were eating fresh, delicious meals - he even prefers the Slimming World Fish and Chips that I make to the ones from the chippy! And he has a slinkier wife into the bargain, so slinky in fact that in October I was crowned Miss Slinky 2016!" Before joining Slimming World, Niki admits that she ate whatever she could get her hands on and suffered the feelings of guilt and shame. "Now I plan and create amazing meals and fill my body with nutritious food and I never feel guilty about eating the treats that I love, because the plan bans nothing!" There have been times on her journey when Niki has really needed the support of her consultant and the group. "They are always there with words of encouragement, it's like having a big sister who is honest and supports you to stay on track. It's thanks to them and food optimising that I can look in the mirror and truly say that I am happy in my own skin. I feel happy, confident and free to be me. Losing weight has benefited my health and going into clothes shops is a breeze now after losing over 4 stone, I no longer have to search at the back of the rail for the biggest size and that feels fantastic! members that I will support in my group." Niki is opening a new Slimming World group at St John's Church Walton on Thursday 5th January at 7:30pm. For further details please contact Niki on 07882 017005.